Secondary porosity effects (bedrock fracture size and orientation) provide preferential flow pathways for LNAPL migration following a release. Fluid flow can be limited to fracture planes, thereby practically constricting aquifer bulk volume. As a result, LNAPL gradients can be greater than in porous media, resulting in increased lateral or vertical migration. Initial LNAPL head pressures focused on finite planar features can exceed those exerted on a more voluminous porous media aquifer and result in LNAPL propagation deep into the saturated zone via vertical and/or sub-vertical fractures (Adamski 2005); (Hardisty 2010). Fluctuations in groundwater elevation may cause “pumping” of LNAPL that result in greater lateral and vertical spread of LNAPL for longer time frames than for unconsolidated materials (Hardisty 2010). Similar to confined or perched LNAPL, the gauged thickness of LNAPL in a monitoring well may not accurately represent the mobile LNAPL interval in the formation. LNAPL penetration into the primary rock matrix may preferentially occur along fractures. Following removal of LNAPL from a fracture, there is the potential for LNAPL within the adjacent primary matrix to re-enter the fracture over time. Approaches to characterization and specific investigation methods for fractured bedrock sites are provided in the ITRC Fractured Bedrock guidance (ITRC 2017a) and other documents. 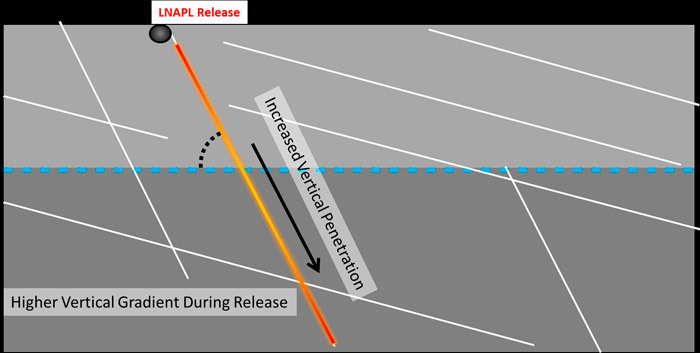 The purpose of this Appendix is to provide information that is focused on the understanding, approaches and methods that uniquely apply to LNAPL releases in fractured bedrock conditions. Type 1 – minimal matrix permeability and porosity results in fluid flow and storage in the fractures (Single porosity). Type 2 – low matrix permeability but high porosity results in fluid flow in fractures, but storage in both the rock matrix and fractures (Dual porosity). Type 3 – high matrix permeability and porosity results in fluid flow and storage in both the rock matrix and fractures, but permeability is enhanced by the fractures (Dual permeability). Type 4 – high matrix permeability and porosity results in fluid flow and storage in both the rock matrix and fractures, with the fractures not significantly increasing flow (Single porosity or equivalent porous media analogue). These simplified schematics (Figure FR-1) are intended to present conceptualized system behaviors, but the practitioner is cautioned to develop site-specific LNAPL Conceptual Site Models (LCSMs) as the range of conditions and behaviors is infinitely variable due to the unique setting of each site. For LNAPL to migrate within fractured rock, the fluid entry pressure of a fracture must be overcome. This concept is equivalent to pore entry pressure for porous media, or the Type 4 category described above. Fracture entry pressure is a function of the difference in pressure between LNAPL and the other fluid(s) present, as well as the wetting angle, interfacial tension between the fluids, and the aperture of the fracture (i.e., the Laplace Equation) (Corey 1990). In the following sections, the concept of LNAPL head is directly related to this entry pressure, whether it is where LNAPL first enters a fractured rock system, or as it migrates through subsurface fractures of variable size (Kueper and McWhorter 1991). 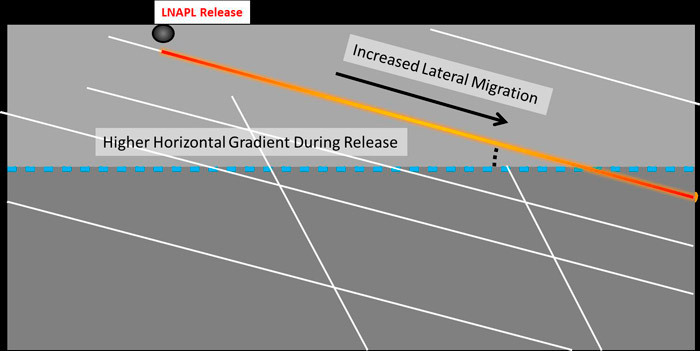 LNAPL migration following a release in a fractured rock setting is driven primarily by fracture size (aperture) and orientation. However, where significant primary porosity and permeability of the bedrock matrix exists, fluid behavior similar to that which occurs in porous media can occur, resulting in what is commonly termed a dual porosity system. The range of behaviors is simplified into the Type 1 through Type 4 rock type hierarchy, with Type 1 units demonstrating the greatest departure from porous media fluid behavior and Type 4 units most closely following porous media behavior. The effect of variability in primary matrix permeability and porosity for the rock types is illustrated in Figure FR-1. Figure FR-1. Rock type and characteristics. LNAPL migration in Type 1 bedrock (e.g., crystalline bedrock), where primary matrix porosity is negligible, will allow for minimal LNAPL entry into the primary matrix. LNAPL will migrate preferentially along larger more transmissive fractures and can be hydraulically up-gradient from the release location. Increased porosity and permeability will result in increased entry of LNAPL into the rock matrix. For Type 2 and 3 bedrocks (e.g., limestone, sandstone), LNAPL will preferentially flow along fractures, but will increasingly penetrate into the primary matrix. Type 4 bedrock (e.g., highly weathered) can behave more similarly to unconsolidated formations. The effect of variability in primary matrix permeability and porosity on LNAPL distribution is illustrated in Figure FR-2. Figure FR-2. Rock type and LNAPL distribution. The primary rock properties controlling LNAPL penetration and distribution in rock types 1 through 3 are fracture spacing and orientation. Where the volume of LNAPL released to the rock exceeds the volume of porosity near the spill, these properties will control LNAPL penetration and distribution. More steeply dipping fracture planes will allow for greater vertical penetration and lower fracture density (or larger spacing between fractures or lower “secondary porosity” relative to the bulk aquifer volume) will also promote deeper LNAPL penetration by focusing LNAPL head on those more discrete and finite preferential flow pathways. Fracture continuity and pervasiveness, which can be a function of weathering or depth, figure into both flow path direction and the continuum from Type 1 to Type 4 behavior. In cases where shallow dip angle fracture or bedding planes are present above the water table and vertical fracturing is absent, lateral LNAPL migration will dominate the post-release plume distribution. The migration of the LNAPL body will predominantly occur in the direction of a fracture dip and follow fracture topography. Higher fracture dip angles, lower primary porosity, and open fractures can result in conditions that are not typically observed in unconsolidated formations (i.e., deep LNAPL penetration). Figure FR-3. LNAPL lateral migration. In cases where near-vertical fracture attitudes are present, LNAPL can be driven deep into the saturated zone due to the limited pathways for vertical migration and resultant buildup of LNAPL head. LNAPL may penetrate below the apparent groundwater elevation where the angle and aperture of a fracture, combined with the pressure head of the LNAPL (i.e., the height of the LNAPL source in the fracture above groundwater), can result in groundwater within the fracture being displaced to a significant depth (Hardisty et al. 2003). LNAPL has been observed at depths exceeding 30 feet (10m) below the water table in fractured rock settings. Figure FR-4. LNAPL vertical migration. Even after reduction or elimination of an LNAPL driving head (i.e., post-release and stabilization), groundwater elevation fluctuations in fractured bedrock have the potential to cause both vertical and lateral redistribution of LNAPL (Hardisty et al. 2003). These effects are most critical in Type 1 and Type 2 bedrock where fracture orientation and frequency are within the zone of groundwater fluctuation. As groundwater elevations fall, LNAPL will tend to migrate vertically downwards through sub-vertical transmissive fractures via gravity drainage. As groundwater elevations rise, LNAPL can migrate along any fracture that is no longer water saturated—including those with shallow or sub-horizontal dips. The result is that the fracture network could effectively act as a “pump” driving LNAPL in unexpected directions, including apparently up gradient, and may result in LNAPL being “trapped” potentially at significant depths below the static water level. Figure FR-5. Changes in LNAPL distribution with groundwater fluctuation (modified from (Hardisty et al. 2003). The difficulty in predicting these movements, combined with the inherent difficulty of constructing monitor wells that intersect the main fractures controlling LNAPL storage and movement, mean that establishing LNAPL body stability may be challenging. This requires a robust LCSM, longer-term monitoring data, and use of multiple lines of evidence. As with porous media frameworks, changing water levels or saturations over time can also lead to further isolation of LNAPL bodies by alternately allowing for drainage from LNAPL-connected pores (or pathways) or trapping of LNAPL in pore or aperture openings too small for non-wetting fluid penetration absent a driving head—resulting in isolated LNAPL ganglia. These fluctuations can also be more pronounced in fractured rock aquifers with karst conditions being the most extreme (CL:AIRE 2014). The gauged thickness of LNAPL in groundwater monitoring wells and open boreholes in fractured bedrock may result in exaggerated LNAPL thicknesses as compared to the mobile interval of LNAPL. These effects are most likely to occur in Type 1 and Type 2 bedrock and can result in confined or perched conditions resulting in exaggerated gauged thicknesses relative to what may be observed in unconsolidated formations (Figure FR-6). There are several tools that may help to clarify these conditions for the LCSM. After well installation, use of diagnostic gauge plots and evaluation of constant LNAPL discharge during LNAPL baildown testing may help with understanding of the location of transmissive LNAPL fractures and the presence of perched or confined fractures. However, unlike unconsolidated formations, evaluation of diagnostic gauge plot data and LNAPL baildown testing can be complicated by 1) the presence of multiple transmissive fractures, each with different hydrogeologic conditions; and 2) the potential for both lateral and vertical redistribution of LNAPL with groundwater elevation changed as discussed above. If these conditions are expected prior to drilling, some techniques are available prior to well installation, such as NAPL Flexible Liner Underground Technologies (FLUTe™) systems, sampling with packers during drilling, etc. Figure FR-6. LNAPL vertical distribution and apparent monitoring well thickness. These conditions illustrate why it is critical to develop the LCSM concurrent with the investigation process, to avoid connecting fractures that may not otherwise be connected. A well connecting two, previously unconnected near horizontal fractures, could cause LNAPL to migrate downward to lower fractured zones. Entry of LNAPL into the rock matrix can occur where the primary matrix porosity and permeability is sufficiently high and is most likely to occur in Type 2, 3, and 4 bedrocks. In situations where the secondary porosity and permeability is higher than the primary porosity and permeability, mobile LNAPL will preferentially flow along the fractures, but may penetrate into the primary matrix over time as shown on the left side of the Figure FR-7. 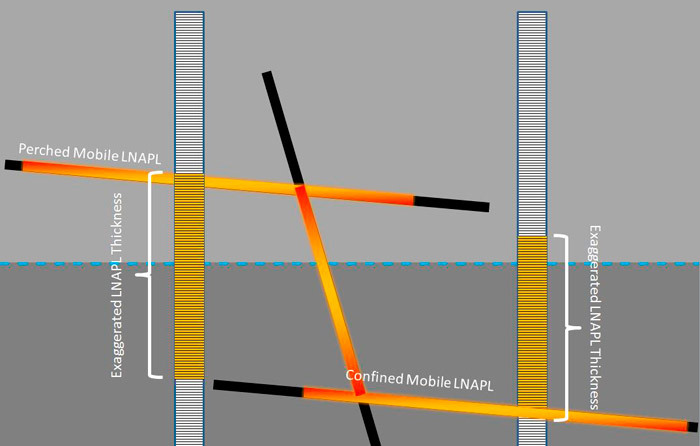 LNAPL recovery efforts will more readily remove the mobile LNAPL within the higher transmissivity fractures; however, mobile LNAPL may also remain in the primary matrix. After LNAPL recovery is stopped, re-entry of mobile LNAPL from the primary matrix back into the fractures may occur. Figure FR-7. LNAPL re-entry into fracture from primary matrix. Conceptually, this poses similar challenges as “back diffusion” of dissolved phase constituents in fractured rock environments. In addition, LNAPL recovery rates and transmissivities may decline during active LNAPL recovery as mobile LNAPL is removed from the secondary porosity, but may rebound if re-entry of LNAPL into the fractures occurs. Development of an LNAPL Conceptual Site Model (LCSM) is described in detail in Section 4 of the main body of this document. The level of detail required to develop an LCSM is in part a function of the complexity of environmental conditions. Although multiphase fluid relationships and flow in fractured rock settings are generally governed by the same physical principals as in unconsolidated media, more extreme ranges in quantification of physical properties are found in fractured rock, resulting in increased variability and complexity. Examples include fracture aperture (analogous to porosity) and bulk hydraulic conductivity, where ranges over multiple order of magnitude are common. In addition, the spacing, pervasiveness, amount of “interconnectedness” and attitudes of fractures (idealized as two-dimensional planes) imparts another layer of complexity to fractured rock fluid flow. The result is that an increased level of detail is typically required to develop an LCSM in fractured bedrock. 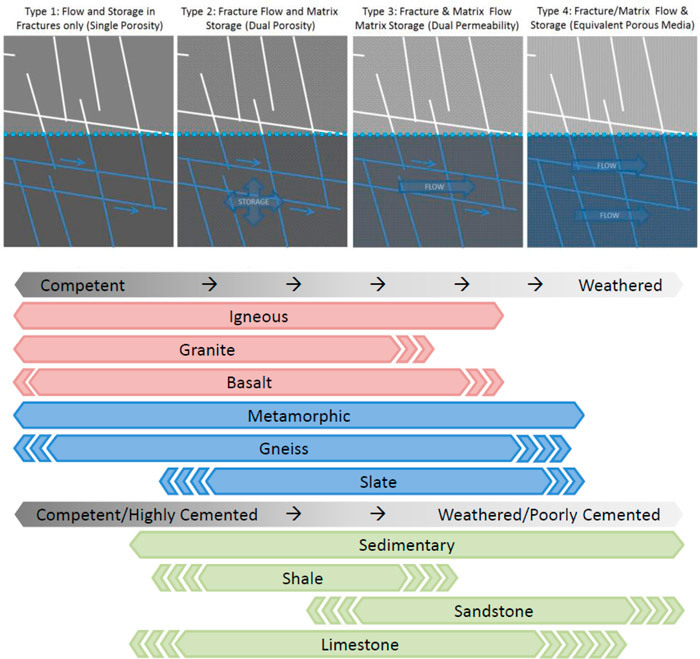 The ITRC Fractured Bedrock guidance (ITRC 2017a) and DNAPL guidance (ITRC 2011) provide a detailed discussion of the methods to develop a Conceptual Site Model in fractured bedrock. For LNAPL releases in fractured rock, practitioners are encouraged to review both ITRC guidance documents. Other tools for assessing fracture systems have been evaluated by the USGS in their Fractured Rock Geophysical Toolbox Method Selection Tool (FRGT-MST). Introduction of an LNAPL with sufficient driving head into fractured bedrock often results in: an LNAPL plume distribution with anisotropic dimensions aligned with dip direction in the unsaturated zone, and aligned with bedding strike in the saturated zone; as well as vertical penetration to underlying beds proportional to bed thickness and/or cross-bed fracturing. In addition, LNAPL penetration into primary matrix pore space would be expected in these units and would increase with time and increased primary pore space of the various interbedded units. Development of an LCSM should include conducting in-depth literature reviews and employing a multiple lines of evidence approach to developing and continually improving LCSMs to match empirical findings. Conventional investigation techniques (i.e., vertical borings and monitoring wells) are typically ill-suited to develop LCSMs in fractured bedrock. However, numerous alternative tools are available and can be used to develop LCSMs in fractured conditions. As real-world fractured aquifer systems exhibit behaviors along a continuum of the simplified Type 1 to Type 4 scenarios, a hybrid LCSM is often the best fit for managing site data and upon which future management decisions can be based. Consistent with Section 4 of this guidance on the development of the LCSM, the following questions are intended to guide LCSM development related to LNAPL in fractured rock. If all or part of a question is immaterial to matrix lithology, then the reader is directed to Section 4. Only those aspects of the questions that are specific to fractured rock are further discussed. This component of an LCSM is generally not specific to the lithology. However, because fractured rock tends to cause LNAPL to migrate farther from the source and in directions not necessarily dictated by the hydraulic gradient, the current and future land use of a larger area may be needed to complete the LCSM. In addition, more detailed information may be needed at an earlier stage in the LCSM process. LNAPL flow and transport in fractured bedrock is typically dominated by secondary porosity (fractures), but primary porosity provides a matrix for LNAPL intrusion. See Chapter 2 of ITRC’s Characterization and Remediation of Fractured Bedrock guidance (ITRC 2017a). The fracture orientation and spacing at an LNAPL release site can be challenging to define on a site level scale, and requires use of multiple lines of evidence in order to develop a detailed LCSM prior to implementation of remedial actions. Karst features can vary from small voids to large caverns. These features can create conduits that are highly variable in flow direction, have flow velocities that can be orders of magnitude higher than the associated bedrock (e.g., limestone), and are often directly connected to groundwater and surface water features. Karst features can lead to potential contaminant discharges to streams, springs, and surface water bodies. Void spaces can also create collection points for LNAPL that can serve as persistent source areas for dissolution to groundwater and for LNAPL sources to the surrounding matrix. It is important to thoroughly assess the potential for existence of preferential pathways that may impact LNAPL migration/distribution when developing the LCSM in fractured bedrock conditions. Stratigraphy, or more generically, the structural fabric of a bedrock aquifer system, is the dominant element to determining contaminant migration direction. Fluid flow in fractured media encompasses study of the geometry and “connectedness” of planar features that offer preferential pathways for migration. These planar features may be bedding, foliation, fractures, joints or similar brittle features and in most cases, will define the direction(s) of the most rapid and significant contaminant migration. Contrasts in hydraulic conductivity between fractures and rock matrix “blocks” are many orders of magnitude greater than those typically found between anisotropic features (i.e., sand lenses in a fine-grained matrix) in porous media aquifers. These extreme contrasts result in more discrete flow pathways in fractured rock systems. Physical properties of the rock matrix, particularly porosity and organic carbon content, can have a major impact on contaminant infiltration and storage in the rock matrix and subsequent back diffusion or re-entry of LNAPL into fractures. Many of the system attributes (rock type, orientation of bedding or structural fabric, fracture type, fracture spacing, etc.) can be determined through evaluation of available geologic literature. The concept of preparing an initial Conceptual Site Model has been addressed in several ITRC documents, most recently including Petroleum Vapor Intrusion (ITRC 2014) and perhaps most germane to this topic, in the Characterization and Remediation of Fractured Rock (ITRC 2017a). Section 2 of the latter document is entitled “Terrain Analysis” and presents a high-level approach to evaluating known and/or anticipated structural and lithologic features of a given site. Much of this initial work should be done as a “desk top” evaluation and provides critical regional geologic characteristics to the LCSM. The lateral and vertical migration of LNAPL in fractured rock is highly influenced by preferential flow pathways and LNAPL can penetrate deeper into the aquifer than typically observed in unconsolidated conditions. Wells have been drilled into fracture systems that can yield water at rates in excess of 275 m3/day (Kasenow 2006). LNAPL introduced into such fractures can result in significant LNAPL migration. The weight of a LNAPL mass may displace water, causing LNAPL to be forced to depth and into permeable zones far below the potentiometric surface. Where possible, the investigator needs to recognize these conditions prior to constructing wells or open borings that may create these connections. This can be prevalent in areas of thin saprolite or thin sediments overlying fractured bedrock. Due to these conditions, reliance on multiple lines of evidence is generally required to determine the lateral and vertical extents of LNAPL in fractured rock. In many cases, CSMs will also need to include areas of the site that may not be bedrock—even if the source is known to exist in a bedrock setting. At any site where soil or non-lithified material overlies a contaminated bedrock aquifer, practitioners must consider the interplay and potential fluid flow (including vapor phase) between the bedrock and overlying media. Not only is the bedrock/overburden interface a critical surface that denotes a marked contrast in hydraulic properties between the juxtaposed media (therefore offering enhanced contaminant flow or storage capability), but vapor phase transport through porous media may still offer clues to the underlying bedrock structure. Due to the marked contrast in fluid conductivities between fractured and non-fractured rock matrices, fluid flow will occur preferentially in fractures (or planar features of significantly higher conductivity than the surrounding rock matrix). This can result in more rapid and laterally extensive contaminant transport for a given hydraulic head. Similar behavior is realized with vapor phase transport. Therefore, investigations to determine the lateral extent of subsurface impact from a contaminant release in a fractured rock setting may encompass a larger area than a porous media setting. Also, vapor phase transport from a fractured rock source through an overlying porous media cover may provide clues as to the bedrock fracture geometry as concentrations of near-surface soil gas may be correlated to deeper source configuration. Soil and groundwater criteria for LNAPL are often based on mobility, measurable thickness, and contact with groundwater from an aesthetic perspective. Because LNAPL in fractured rock may be more difficult to intersect with traditional investigation techniques, indirect measurement tools may be used to develop the LCSM. These indirect tools and techniques target the vapor or dissolved phase and are based on the theoretical solubility of an LNAPL. Direct measurements may include hydrophobic dyes that can detect small amounts of LNAPL in the matrix or groundwater, or analysis of pulverized rock for presence of sorbed LNAPL. There are no unique differences in fractured bedrock. The area in which to evaluate receptors and pathways may need to be increased, especially in directions parallel to preferential fracturing, due to the increased potential for LNAPL migration along preferential pathways. Receptors such as groundwater extraction wells in the vicinity of an LNAPL release can have a greater radius of influence in fractured rock conditions, and these effects should be considered when establishing the area in which to evaluate receptors and pathways. The duration of monitoring of sensitive receptors should consider the effects of migration in fractured rock that can impact LNAPL body stability. As described in Section 2, even after reduction or elimination of an LNAPL driving head (i.e., post-release and stabilization), groundwater elevation fluctuations in fractured bedrock have the potential to cause both vertical and lateral redistribution of LNAPL (Hardisty et al. 2003). Fractures are also more susceptible to seasonal groundwater potentiometric surface variation. These include significant vertical smear of LNAPL along fracture walls, introduction of LNAPL to permeable zones at depth that may be “trapped” in stratigraphic and structural features. This would be most prevalent in areas that experience high seasonal variation in groundwater levels or in coastal areas that experience significant tidal ranges. LNAPL present in fracture rock conditions can behave similarly to confined/perched LNAPL in unconsolidated formations. Gauging data collected in equilibrium conditions can be evaluated and interpreted using diagnostic gauge plots to inform understanding of the hydrogeologic condition of the LNAPL, and may provide insights into the rock type. In Type 1 and 2 bedrocks LNAPL present in transmissive fractures is likely to behave more similarly to confining/perched conditions. Development of LCSMs in fractured rock requires similar approaches and tools as for investigation of general fractured bedrock Sites (ITRC 2017a) – Fractured Rock Tools Tables) as well as DNAPL (ITRC 2011) — Click for DNAPL Tools Tables). A summary of the most applicable tools to development of an LCSM is provided in Table FR-1. View Table FR-1 in Adobe PDF format. Remediation in fractured bedrock is subject to the same constraints as porous media, with the added challenge that explicitly mapping the transport pathways (fractures) and mass distribution is more difficult, or in some cases, impossible. This is one of the primary reasons that pump-and-treat remediation is commonly selected in complex fractured rock systems. A key limitation in fractured bedrock remediation is access to the target compounds and distribution of reagents, when injection-based in-situ remedies are applied. The second matrix in Appendix A summarizes data requirements and data collection methods to evaluate remedial alternatives at fractured rock sites. An important factor regarding the efficacy and cost for treatment, particularly in source areas, is the degree to which mass has diffused into the matrix and the potential significance of “rebound” that may occur due to back diffusion. When COCs are contained primarily in the fractures, remediation can have significant benefits in a relatively short period of time and pump and treat can be applied as a remedy, not just a containment measure. In cases where a significant mass of recalcitrant compounds has diffused into the matrix, access to the source material can be inefficient, commonly resulting in rebound after in-situ treatment, or extended duration of pump and treat. The reverse-diffusion effect on remedial timeframe may not be as significant for contaminants that may degrade in the matrix (e.g., aromatic hydrocarbons) if conditions are conducive for decay in the matrix or upon reverse-diffusion back into the fractures. Mature plumes of recalcitrant compounds, however, often require the most aggressive measures of remediation, such as thermal treatment or chemical oxidation to significantly reduce mass. Table FR-2 summarizes the applicability of conventional remedial technologies and provides a relative ranking as to their cost, reliability and period of performance. View Table FR-2 in Adobe PDF format.